Chemex vs Aeropress – Should you Pour, or Press? →Chemex vs Aeropress – Should you Pour, or Press? Chemex vs Aeropress – Should You Pour or Press? Chemex vs Aeropress – both are extremely popular coffee makers at the moment but which one is the better for you? 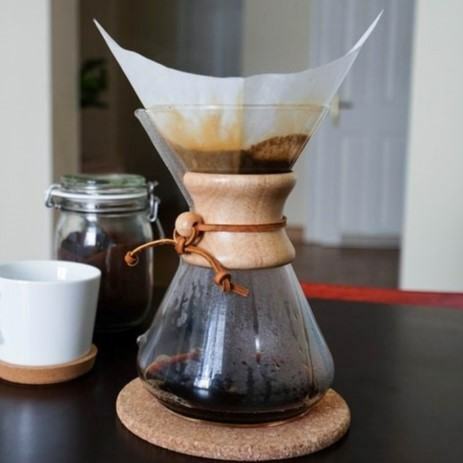 To brew using the Chemex​ coffee maker, begin by placing a filter in the Chemex folded into three parts. Then, rinse the filter with hot water, pour the water back into the pitcher, and add the amount of coffee that you desire. One of the reasons people rave about the Chemex is because of its' clean, simple design that consists of one glass vessel, a handle, and a cord. On top of it's looks - you'll have a lot of extra counter space, too. You'll also find that the Chemex is somewhat affordable: for less than $40, you can get the 8-cup classic coffee maker and a 100 count box of filters for around $8. The most popular feature of the Chemex, however, is that it gives you the ability to control the coffee you make – the temperature, flavor, the grind, and even the pouring technique. To begin brewing with the Aeropress, you'll need to pour just a bit of water onto the round coffee filter to rid the coffee of any paper tastes while you preheat your vessel. Next, add your desired amount of coffee into the Aeropress, which should be resting on top of your mug. Add the remaining water to your Aeropress and gently press the coffee into your cup consistently until most of the water is gone. Out of all the wonders of the Aeropress, you'll be super happy (like so many others) with the intense and unique flavor it produces. Because you are totally immersing the coffee grounds into the water, you are getting a very rich, flavorful coffee like none other. You've seen the process and features involved with each coffee maker, but which one is the best? It's time to put them head-to-head and judge based on brew time, skill level, and the quality of the end brew. ​Because there is so much air pressure applied when brewing with the Aeropress, your brew time is nearly cut in half. Instead of spending 7 minutes waiting for your coffee to brew, you can have it ready in as little as 1 minute (with only 30 to 60 seconds of brew time) when using the Aeropress. Again, there's more than one way to brew with an Aeropress, but in general, they are all fast ways to brew. WINNER: The Aeropress wins when it comes to brew time. For the incredible, strong coffee flavor that you're getting in such a short amount of time, the Aeropress is great for time poor humans (most of us). The Chemex has a unique, stylish design that a lot of you coffee fanatics probably love: simple, clean, and classic. It's made of nothing more than a glass vessel, wooden handle, and a cord, and surprisingly is featured in art galleries around the world. WINNER: Hands down, the Chemex beats the Aeropress for a more stylish appearance, which we can agree is critical for home brewing in front of a crowd. Coffee newbie? The Aeropress is very easy to use and requires no special coffee making skills. It's a very straightforward process with an easy clean-up time. The Chemex was made for more skilled coffee fanatics in mind, and this is reflected in the brewing process. Like the Aeropress, you will need to add your filters and preheat your coffee. But, you will also need to allow your coffee sufficient time to 'bloom' for 30-45 seconds. After you have poured the majority of your water into the Chemex, it will need to bloom, and a very precise pouring method follows this - taking approximately 5 minutes to brew. WINNER: regarding skill required the Aeropress is the easiest coffee maker to master. If you have very rushed mornings or don't want to devote a lot of time to making your coffee, it's the best choice for you. Remember - The Chemex will give you the freedom to control everything about your coffee, from the temperature to the texture - so if you're the type that values control, go for the Chemex. It all depends on your preference. Personally, I love the Aeropress because the immersion of ground coffee beans and water results in a delicious, strong, flavor of coffee that smells and tastes incredible. You'll find that the texture of the coffee is remarkably smooth because of the pressure involved during the brewing process. Like most of us, you probably aren't a fan of gritty coffee at all, and with the Aeropress, the coffee is micro-filtered to ensure the purest form of coffee possible. Aeropress coffee is unique because it doesn't push so hard that it adds bitterness.Instead, it pushes just enough so that the best part of the coffee bean is extracted, leaving out all of the bad in coffee. That's what makes Aeropress incredible. WINNER: Both of them, for different situations. The Chemex is the best choice for families or those who love to entertain. You'll be able to ask your guests how they like their coffee and proceed to impress them with your rad coffee making skills. 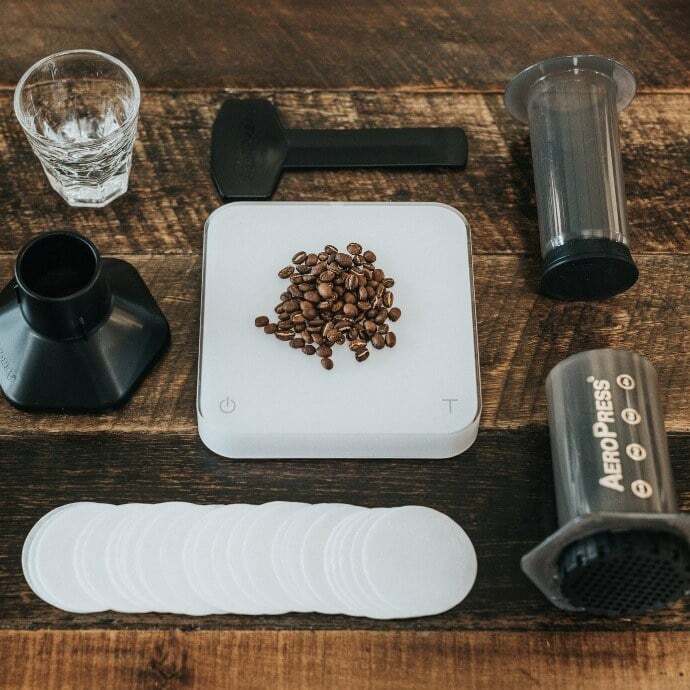 With the Aeropress, you'll only have the option of making a very strong coffee, but it will happen very fast, and the clean up will almost be non-existent. Perfect for you if you travel or just love a quick brew. It should be clear now that both the Chemex and The Aeropress have incredible benefits that are right for some, but not for others. The Aeropress isn't winning any design awards, but if we're talking convenience and portability, there's nothing better. Don't forget that you'll still get a quality brew thanks to the innovative process it uses to brew. The Chemex isn't a fast way to make a coffee, and you can forget about traveling with it, but it's a beautiful way to make pleasant tasting pour-over coffee (that you can control with precision). If you're the type who likes to entertain a crowd, and you've got an eye for good design, the Chemex will keep you happy. You want a winner? If you ask us - it's the AeroPress. This gadget has world championships dedicated to it in all parts of the world. That says something about its following. Perfect for the traveller and home brewer alike. Not the best for large groups. But who wants to share their damn coffee, anyway? Not me. Now that this Chemex vs Aeropress pickle has been solved, continue your journey to become an epic home barista by reading a few more articles here. I make two cups of coffee in the Aeropress with one press only. Moreover, I do not use the inverted method. After I place my coffee grounds in the Aeropress on top of my mug, I add hot water up to the top. I stir for 20 seconds, then press. I pour the coffee into a glass coffee server, then pour the remainder of the hot water into the server. Voila! Two mugs of coffee. Nice Jeri! I find that when I do a 2x aeropress in one brew sitting, its not up to my strength standards. Sounds like you have it wired, though!